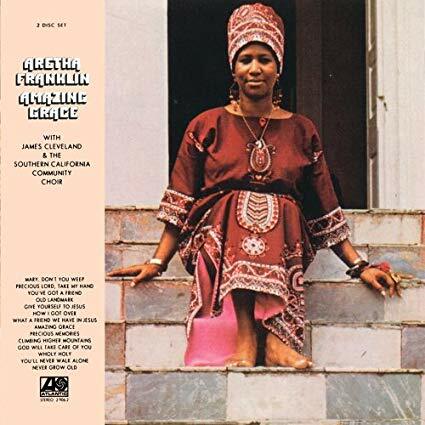 With all due respect to the towering Atlantic sides of legend, Aretha’s finest hour, the moment captured that still brings me to my knees every time I hear it, is her 1972 gospel album, Amazing Grace, released as a double-vinyl collection, recorded live at the New Temple Missionary Baptist Church in Los Angeles. Not since Elvis’ two 60s gospel albums and Peace in The Valley EP from 1957 had a truly towering mainstream artist delivered such a profound faith manifesto, both artists doing so at the height of their commercial powers. I still regard it as a courageous move on Atlantic’s part to release Amazing Grace instead of another surefire smash soul album with multiple hit singles practically guaranteed; however the decision was made, it paid off in multi-millions in album sales and a1973 Grammy Award for Best Soul Gospel Performance. Back then a gospel album’s success on this scale seemed impossible; in today’s more secular society, when gospel has practically disappeared from the mainstream both in fact and in influence, it seems nigh on to a miracle. Forty-six years after its release, Amazing Grace remains the best-selling release of Franklin’s career and in the history of live gospel albums. Verily, she did get over. So I am surely not alone in turning to it for spiritual sustenance. To hear Aretha absolutely setting the church on fire and wringing every last ounce of faith and redemption for the entirety of a near-11-minute fire-and-brimstone scalding of “Amazing Grace” is to hear testifying of an exalted order, approached only by Mahalia. And with the backing of the choir directed by the Rev. James Cleveland, a gospel giant worthy of sharing this pulpit, a circle becomes complete. Once the child Aretha’s mentor, now he’s spurring the choir to summon the angels as the mature Aretha ups the emotional ante at every turn, whether it be in de- and reconstructing Inez Andrews’s’ “Mary Don’t You Weep”; finding a seam in Carole King’s “You’ve Got a Friend” and reimagining it as a hymn of faith; igniting the worshipers with an incendiary call-and-response with the choir on “What a Friend We Have in Jesus”; or, with a scintillating assist from the Rev. Cleveland and the animated choir, bending and shaping “Precious Memories” into an extended, sweat inducing blues workout. This goes on and on through four sides of the original release, the spirits of Bessie and Mahalia materializing in, meshing with and being redefined in Aretha’s earthy attack. The double-vinyl release was in fact edited from two nights’ worth of services finally made available in 1999, unabridged on a splendidly remastered double-CD set, Amazing Grace: The Complete Recordings, guaranteed to leave a listener limp but spiritually reinvigorated. Speaking to the assembled multitude, the Rev. C.L. Franklin, Aretha’s father, steps up to remind those on hand, “if you want to know the truth, [Aretha] has never left the church!” So herein she resides, right where she belongs, never better, completely in command of her art, her soul soaring free and unfettered Heavenward. Herein lies the truth. Amen, and Godspeed great lady.